As per Section 120B, an accused, if found guilty, is punished according to the nature of the conspiracy. Considering the accused are also charged with other five sections (153, 153A, 295, 295A, and 505) of the IPC, if found guilty, they could be looking at an imprisonment of minimum six months to five years or more, depending on the CBI court's verdict. 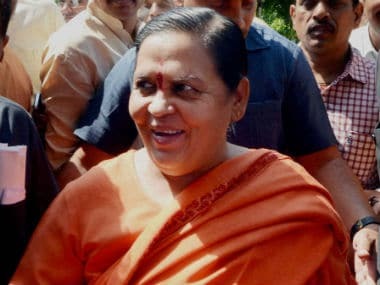 Uma Bharti, who faces charges of criminal conspiracy in the Babri Masjid demolition case, said on Tuesday that there was no conspiracy but an "open movement" which led to the demolition. Bharti said she appeared in the special CBI court out of respect for the court but had "expectations only from God". "In a matter concerning God, my hopes also rest on God. Because I contributed (in the movement) with complete faith, I don't consider myself guilty," she said. Senior BJP leader LK Advani refused to sign the papers and only signed the court docs after being persuaded by his lawyers, India Today said. According to the TV news channel, Advani wrote on paper in Hindi: "Mai aaropo se inkar karta hu (I reject the charges)". 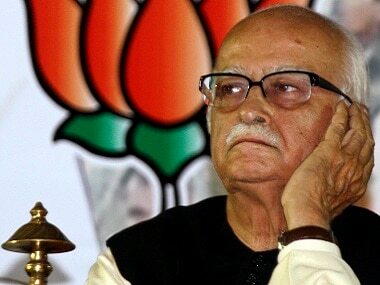 Advani has been charged with criminal conspiracy in the Babri demolition case under Section 120B read with sections 153, 153A, 295, 295A and 505 of the Indian Penal Code (IPC). All the 12 accused in the accused in the case have also denied the allegation. the charges levelled against them are false. Court has fixed date for tomorrow. The CBI court has said that th ere's enough evidence on record against Lal Krishna Advani, Murli Manohar Joshi, Uma Bharti and others for framing charges of criminal conspiracy, PTI said. Earlier today, the CBI court had rejected the discharge petition. The 12 accused in the case along with the three senior BJP leaders have been charged with criminal conspiracy under Section 120B read with sections 153, 153A, 295, 295A and 505 of the Indian Penal Code (IPC). "I guess one person who will be contemplative today is Advani... Lot of people in BJP will be thinking if the government they put into office is turning on their own." Congress leader Manish Tiwari said after the court granted bail to Advani and others accused in the case but refused to discharge them of charges. In CRPC, there lies a provision under which the accused can be discharged before the charges are framed against him, if the charges are found to be groundless. A discharge application works only to ensure that the prosecution has levelled the legally correct charges on the basis of available facts. The court doesn't go into examining the evidence at this stage. For example if there was a charge of theft and the prosecution couldn't point to what was stolen then the accused would get a discharge. But if there is a stolen article, then there is room for a trial and hence discharge will not be granted. A rejection of a discharge plea says nothing about the actual merits of anyone's case. The provision is more focused on examining that whether is a scope for a trial or not. According to the latest reports, the discharge petition has been rejected by the court and the charges against the accused will be framed now. The dispute is at the heart of the Hindu-Muslim communal rift in Uttar Pradesh. For more than half a century, the dispute has fuelled mass polarisation in the state and has prompted the country's worst spate of religious violence since the Partition. Special CBI court to announce charges in a while, TV reports have said. Special CBI court has convened, News18 reported. Counsels and judges to now start proceedings to frame charges in the Babri case. Meanwhile, reports said that a team of lawyers were present in the meeting between Yogi Adityanath and Advani at the VVIP guesthouse in Lucknow. The conspiracy charge against Advani and others was dropped by the special CBI court in 2001, which sought to distinguish between the main demolition case and the case related to the hate speeches. The decision was endorsed by the Allahabad High Court in 2010. 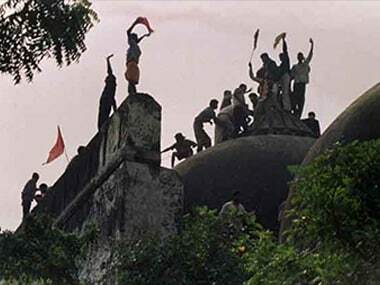 Restoring the charge, the Supreme Court described the demolition of the 16th century mosque on 6 December 1992, as a "crime" which shook the "secular fabric of the Constitution". The court had also strongly rebuked the CBI for a delay of 25 years in the trial and said, "The accused persons have not been brought to book largely because of the conduct of the CBI in not pursuing the prosecution of the aforesaid alleged offenders in a joint trial, and because of technical defects which were easily curable, but which were not cured by the state government." Speaking to ANI, Union minister Venkaiah Naidu came out in support the party stalwarts who are prime accused in the Babri Masjid demolition case. When asked that why in 2001, with Atal Bihari Vajpayee as the prime minister, the CBI had said 'no conspiracy' and under Narendra Modi, the CBI seeks to charge them with criminal conspiracy, Naidu said such questions should be directed to the CBI. "This is a legal process, let it happen. Our leaders are innocent and they will come out unscathed. I don't want to make any comment," Naidu was quoted as saying by ANI. Uttar Pradesh chief minister Yogi Adityanath reached the government guest house in Lucknow to meet Advani ahead of the hearing. The BJP has firmly thrown in its weight behind the accused leaders, reiterating that the party will not interfere in the course of justice but will ensure that the Ram temple is made in place of the disputed structure. The issue of Ram temple even reappeared in the BJP's manifesto ahead of the Assembly Elections in Uttar Pradesh. The leaders are already facing trial for making provocative speeches from a platform near the mosque before it was pulled down by karsevaks, or right-wing volunteers. The special court was given a month to frame fresh charges against 89-year-old Advani and a dozen other leaders and was asked to deliver its verdict within two years after daily hearings. The conspiracy charge against Advani and others was dropped by a special CBI Court in 2001, and the decision was endorsed by the Allahabad High Court in 2010. The Supreme Court last month had directed that BJP leaders including L K Advani, Murli Manohar Joshi and Uma Bharti, would face trial for conspiracy charges in the Babri case. It also transferred the trial of a separate hate speech case from a Raebareli to the special court in Lucknow for a joint trial with the main demolition case. Speaking to reporters, BJP MP and accused in the case, Sakshi Maharaj reasserted that he did not think that he did anything wrong by being a part of the movement that led to the demolition of the Babri mosque. From being the face of the Hindutva brigade to now charged with criminal conspiracy, if found guilty, MM Joshi, Uma Bharti and LK Advani are likely to be looking at a rough ride ahead. The CBI court on Tuesday said that the investigation agency has sufficient evidence on record to charge them with criminal conspiracy, and set the next date for Wednesday. Read a detailed analysis here. The special CBI court, which rejected the discharge petition of all the 12 accused including senior BJP leader LK Advani on Tuesday, has been asked to pronounce a verdict within two years with the next date set for tomorrow. 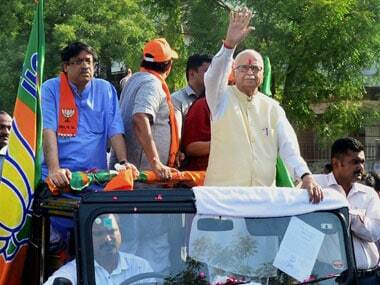 On Tuesday, Advani, 89, made his second court appearance in the case in 25 years. BJP leader Shazia Ilmi, reacting to the CBI court's order to dismiss the discharge petition of party stalwarts said, "You have to establish legally that the onus will be on the prosecuted. It is up to to the Prime Minister whether he wants to keep Uma Bharti as a minister or not." According to News 18: "The accused are charged under IPC section 120B (Punishment of criminal conspiracy) read with 153 (Promoting enmity between different groups on grounds of religion, race, place of birth, residence, language, etc., and doing acts prejudicial to maintenance of harmony), 153A, 295 (Injuring or defiling place of worship with intent to insult the religion of any class), 295A and 505 (Statements conducing to public mischief)." Charges will be framed against all 12 accused, including LK Advani, Murli Manohar Joshi and Uma Bharti in the Babri Masjid demolition case. Hearing of charges against LK Advani, Murli Manohar Joshi and Uma Bharti and others continues in the special CBI court. "Within the next half an hour, the court should take a decision," Prashant Singh Atal, lawyer for the accused in the case, told CNN-News18, when asked about how much time the court will take on deciding on the discharge application. If the discharge application is rejected, charges will be framed against the accused. "This whole case is totally devoid of any merit," BJP leader Subramanian Swamy told CNN-News18. "There was no masjid which was demolished in the first place." Swamy said that the structure which was demolished was not a masjid, but a temple in which pujas were taking place. CNN-News18 further reported that the hearing on the framing of charges is still on. The lawyer for the accused said that the accused submitted a discharge application in which the accused have said that there is no case against them. The first one to reach the court premises was Shiv Sena leader Satish Pradhan, followed by Advani, Joshi and Bharti. Sadhvi Ritambhara, Vinay Katiyar, Ram Vilas Vedanti and Mahant Gopal Das also reached the court premises separately. Former MP Ram Vilas Vedanti, who is on bail, said he had told the court earlier too that he brought down the mosque. He announced that under "the rule of Modi at the Centre and Yogi in the state, a grand Ram temple would be constructed at Ayodhya". Rajya Sabha MP Vinay Katiyar said he had no regrets about the demolition of the Babri Masjid as millions of faithful had "willed" that there be a Ram temple and that the dilapidated structure be razed to the ground. 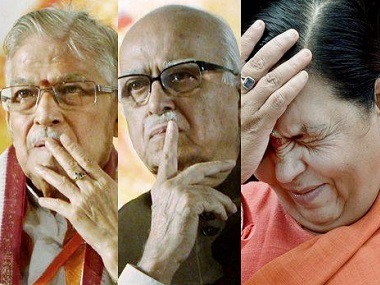 BJP stalwarts L K Advani, Murli Manohar Joshi and Uma Bharti will appear before a special CBI court in Lucknow on Tuesday for framing of charges in the Babri Masjid demolition case. 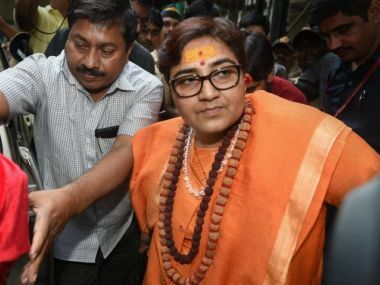 Besides them, special CBI judge S K Yadav had asked BJP leader Vinay Katiyar, VHP's Vishnu Hari Dalmia and a one-time firebrand Hindutva preacher Sadhvi Ritambara to present themselves before the court in person. The Supreme Court had on 19 April ordered prosecution of Advani (89), Joshi (83), 58-year-old Bharti, and other accused of criminal conspiracy in the politically sensitive case. It had also ordered a day-to-day trial to be concluded in two years. The top court had called the destruction of the medieval-era monument a "crime" which shook the "secular fabric of the Constitution" while allowing the CBI's plea seeking restoration of the criminal conspiracy charge against the four BJP leaders, including Katiyar (62), and others. It had transferred the case against Advani, Joshi, Bharti and three other accused from a Raebareli court to Lucknow for a joint trial in the demolition case.